Nestled in an intimate garden, tucked behind the Tower Grove House (the country home of Missouri Botanical Garden founder Henry Shaw), is a plot dedicated to some of the oldest friends of man: herbs. Herbs historically have been used for their fragrance, utility, medicinal qualities and culinary value. Ancients used them to ward off evil spirits or to imbue an individual with desired attributes such as vigor and courage. Romans perfumed baths with lavender (Lavandula officinalis), derived from the Latin laver which means “to bathe.” Medieval servants would strew sweet-smelling herbs on floors in a time when cleanliness and hygiene were little noted. There are some 350 varieties of herbs in the small 90-by-56-foot Herb Garden, which is maintained by The St. Louis Herb Society™. Society members plant from 1,000 to 1,200 plants a year, giving the Missouri Botanical Garden a list each fall of what they will need in the coming year. 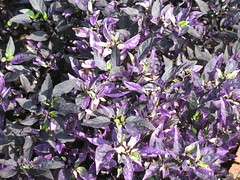 Some plants are purchased, but most are grown inside the Garden’s greenhouses. The Herb Garden displays many varieties, allowing visitors to see how specific herbs grow in this area. The plot is located right outside Shaw’s old back door; however, it is not a replica of any previous garden. In fact, this space south of the house originally consisted of driveways to accessory buildings and stables. The layout of the Herb Garden reflects the historical use of the plants. Although specific plants might vary from year to year, they are grouped into four main categories: culinary, medicinal, fragrant and utility (ornamental, cosmetic, dye and household) herbs. The culinary beds on the east border contain herbs used in cooking that most people are familiar with: varieties of basil (Ocimum basilicum), dill (Anethum graveolens), chives (Allium schoenoprasum), rosemary (Rosmariunus officianalis) and oregano (Origanum vulgare), for example. In the southwest corner under the shade of a cornelian cherry (Cornus mas) grow sweet woodruff (Galium odoratum), primroses and other shade-tolerant plants. Medicinal herbs are located along the southeast garden border. Selections include foxglove (Digitalis purpurea) used for heart disease, and periwinkle (Catharanthus roseus) used for various cancers, including leukemia. 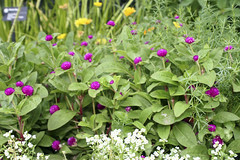 The southwest corner bed features fragrant herbs, noting that the warmth of the sun intensifies most herbs’ fragrances. Some of the more aromatic plants displayed are sweet woodruff (Galium odoratum), lemon verbena (Aloysia triphylla) and varieties of scented geraniums (Pelargonium spp.). On the northwest corner is the utility bed containing plants that are considered “useful,” such as yarrow (Achillea filipendulina) and bloodroot (Sanguinaria canadensis), which can be used in dyes. Lady's bedstraw (Galium verum) can help curdle milk in cheese making (and was used to stuff mattresses and flax (Linum perenne) can be used for its fiber and seeds. In the center of the Herb Garden are eight curved beds. The four on the west contain varieties of rosemary and lavender, and the four on the east generally contain basil and sage (Salvia officinalis). The beds have borders of germander (Teucrium chamaedrys), which can be used for room fresheners or wreaths. Two cornelian cherry trees (Cornus mas) stand at each end of the south wall, and there are a variety of other plants such as boxwood, roses, holly and peony throughout the garden. Two sculptures grace the Herb Garden. The first, centered in a bed of thyme (Thymus vulgaris), is a figure of a boy sundial, donated many years ago by a former member of the Herb Society, Alice L. Hirsch (Mrs. Herman). The second is a millstone fount ain installed in 2008 in memory of longtime society member Dorothy Raether. The St. Louis Herb Society™ has been intimately connected to the Missouri Botanical Garden for more than a half century. In 1941, a group of women approached then Garden Director Dr. Edgar Anderson, also a past president of the Herb Society of America. They asked if he would help them learn about herbs, and he agreed, thus beginning a relationship between the Society and the Garden that has lasted to the present. By 1955, the study group had dissolved an affiliation with the Herb Society of America to officially become the St. Louis Herb Society, reflecting its emphasis as a local group. The original herb garden at the Missouri Botanical Garden was established in 1952 on the east side of what was then the library, now the Shoenberg Administration Building. Unfortunately, the plot was located on the shady side of the building, and therefore did not last long. By 1964, the Society had a garden, designed by Edith Mason, on the east side of the present space; the western half was maintained by The Garden Club of St. Louis. In 1976, the Society was asked to take over this entire area in order to unify the space south of Tower Grove House. It was redesigned by member Joyce Driemeyer and the Society joyfully undertook the duties of planting, pruning and harvesting herbs on a weekly basis, which continues to this day. 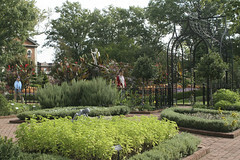 The Herb Garden has retained the flavor of the Garden’s Victorian District, of which it is a part. The garden is of Victorian design, geometrical and orderly. It mimics the complex but symmetrical design popular at the time that made gardens places of serenity and contemplation. 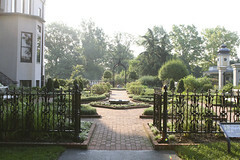 That essence was retained throughout extensive renovations made to the Herb Garden in 2003 using funds raised by the Society. The project involved dismantling all pathways, which had settled in uneven patterns; removing the top six feet of soil and replacing it with rich alluvial soil from the confluence of the Mississippi and Missouri Rivers; relaying thousands of bricks on widened paths; and enclosing the garden with a uniform black wrought iron fence to replace the original. A modern irrigation and drainage system was also installed. The St. Louis Herb Society™ was the first volunteer organization given access to the greenhouses and to work in the Garden. At the time, all plants for the annual Herb Sale and Herb Garden were propagated in the greenhouses by society members, with assistance from the Horticulture staff. All proceeds from plant sales went specifically to benefit the Garden’s Horticulture Division. Today, in addition to caring for the Herb Garden, The St. Louis Herb Society™ holds fall and spring herb classes for adults, hosts an annual Herb Days event each spring and sponsors a speakers’ bureau. Its fourth cookbook, “Herbal Cookery: From the Kitchens and Gardens of the St. Louis Herb Society,” and other publications written by the Herb Society are available for purchase from the Garden Gate Shop or online at www.stlouisherbsociety.org. Discover a different herb each week. The first 200 participants will pot one up to take home. Included in Garden admission.